Exuding curb appeal and suburban charm, this Oakbrook two-story has four bedrooms, three bathrooms and is in a location that can’t be beat! Enjoy a quiet morning and mountain views from the covered front porch overlooking the front garden and grassy lawn. Natural light streams into the formal living room, finished with picture rail moulding and soft carpet. Crown moulding decorates all living spaces throughout the home. Make way into the formal dining room with hardwood floors and plenty of space to host guests. Abundance of storage in the open kitchen with upgraded cabinetry! The kitchen effortlessly flows into the casual dining area with direct access to the expansive back porch. Stay cozy in the family room with a brick-surround fireplace and window nook with a splendid view of the lush backyard. Powder room also on the main. Head upstairs to the master suite with gleaming hardwoods, cedar-lined walk-in closet and en suite bath with a luxurious marble-topped vanity. 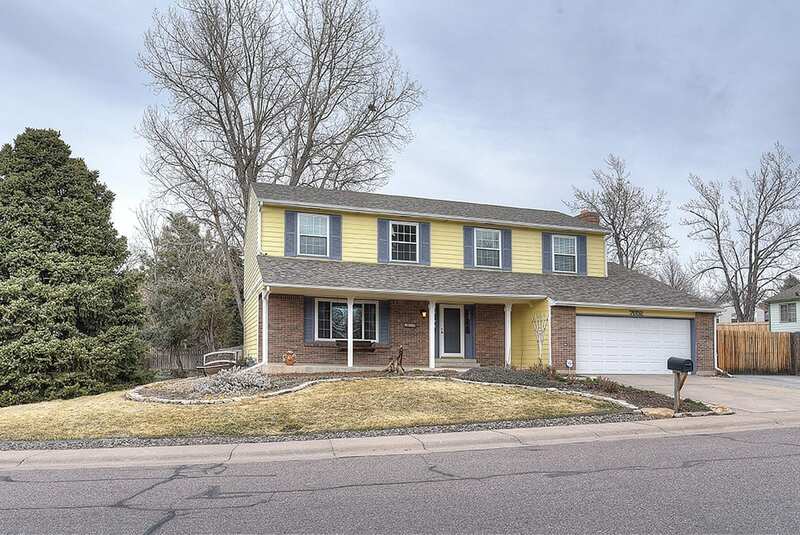 Three additional rooms upstairs, along with a full bathroom with an updated vanity and slab granite countertop. Room for expansion in the vast unfinished basement! Rest easy with a new water heater (2018) and newer roof (2017). New carpet throughout. Remarkable outdoor space. Not only does the terraced backyard include a garden area, deck and grassy yard, it is further enhanced with a water feature, utility shed, furniture and grill. Attached garage along with parking for three vehicles out front and space for RV parking to the side. Take a short walk to Puma Park, Lee Gulch trail and public transportation, all a block away! Powell Middle also within walking distance. Easy access to Littleton Hospital and C-470.